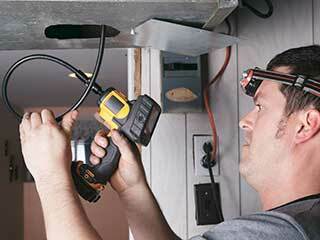 Home Our Air Duct Services Air Duct Cleaning Is Professional Air Duct Cleaning Really Worth It? Air ducts are interconnected with HVAC systems, which circulate air through living spaces to either heat up or cool down the surrounding environment. Though you can’t see what’s within your air ducts, if you haven’t had them professionally cleaned, the chances are your air ducts are recirculating dust, dirt, and debris. This is often neglected by people who can’t see the problem, so they assume it doesn’t exist. With this being said, sometimes it’s what we can’t see that's most troubling. The quality of the air we breathe is a vital consideration. The last things you want to breathe in are dirt and dust. Professional air duct cleaners have all the tools necessary to effectively clean those hard to reach spaces, but is it really worth employing a professional to attend to your cleaning requirements? This article will assess whether air duct cleaning is necessary, giving you a chance to evaluate whether you want to use the services of an air duct cleaning company. If you suffer from allergies, air duct cleaning is vital to improve the quality of air you’re breathing in. Though there are multiple causes of indoor allergies, after cleaning you’ll probably notice a dramatic reduction in the state of your allergies. It’s important to evaluate your home, looking for potential allergens that could be aggravating things. Air ducts are more difficult to evaluate, so a professional is required to remove any contaminants that are causing problems. Have You Just Performed Construction Work? Construction work can leave dirt and debris everywhere, which becomes a nuisance if it gets stuck in your air duct. Though you can remove some of this yourself, a professional air duct cleaner will properly attend to your requirements, removing the dirt present in those hard to reach spaces. If you take a flashlight to assess the condition of your ducts, any visible dirt and dust will indicate it’s time to do something about it. Not only will this affect your breathing quality, but it can be contribute to increased energy bills too. Rather than paying through the roof unnecessarily, a professional can alleviate your outlay considerably. Thanks for reading this article. We hope you have found it useful, and have a better understanding of whether air duct cleaning is really worth it. If you have any questions, please contact our team of experts and we’ll get back to you!